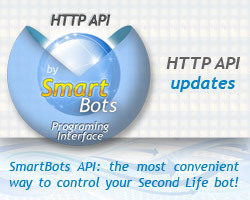 SmartBots HTTP API functions have been extended by adding the new functionality. listinventory command allows listing the bot’s inventory: items, wearables, folders. Now this command shows the object’s permissions. More information available in docs. give_inventory command sends inventory items to a specific resident. Now it is possible to send the whole folders (just specify the folder inventory UUID – system determines the inventory item type automatically). Also, the error handling has been improved: the function now returns an error if object permissions do not contain a ‘Transfer” flag. These changes are published already, you may use them in your applications or try HTTP API by using SmartBots API Testing Suite. SmartBots bots are able to give out inventory: as notice attachments and while inviting visitors to the Second Life group. 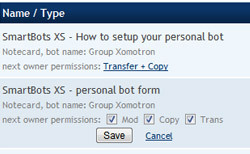 Now you can set the “next owner’s” permissions by using SmartBots web account, and set the end-user permissions for the inventory items to deliver (copy only, copy+trans or whatever you need). See the SmartBots documentation page for details.